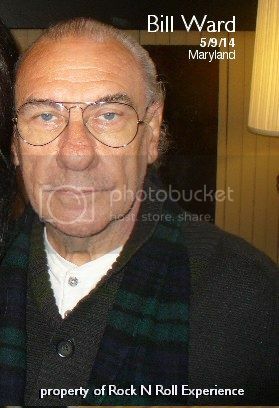 Bill Ward is best known as the original drummer for Black Sabbath. He laid down beats for “War Pigs”, “Iron Man” & “Paranoid” to name but just a few of the many hard rock hits he was a part of. Bill Ward was kicked out of Black Sabbath when the band decided to record a reunion record and do a tour with the Ozzy/Iommi/Geezer line up in tact. 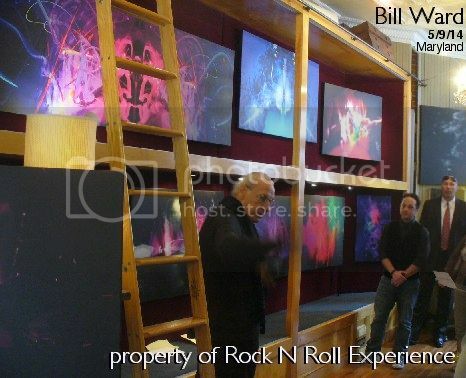 Bill made a stop in Maryland on May 9 & 10th to peddle his latest venture, a series of high end strictly limited edition art prints. Each print is hand signed/numbered and each canvas is a unique design which captures Bill playing drums while using laser tipped drum sticks. The art itself is basic abstract art and in some prints you can clearly see Bill in the mix but the art is more about rhythm and motion for the most part. I attended the May 9, 1 PM art showing which was the first one he did on this run and the hour long sales pitch from Bill was basically him explaining each piece, how it was created, and then he would answer a few questions from fans. Probably the oddest moment was when blood began to drip down Bill’s leg quite heavily to a point where the bottom 1/2 of his leg had a steady stream of blood pouring down. Bill’s assistant bent down to wipe the blood and an embarrassed Bill joked that as long as no one minded him bleeding the show would continue. Bill stated that he was on different medications and that one particular blood thinner causes him to bleed randomly sometimes. The art prints for sale ranged in price from $500 - $1,500 and I was quite surprised to see about 15 people total at the first showing of his art. Bill was very gracious, he greeted fans after the show, took pictures with anyone who asked for one and signed stacks of Black Sabbath memorabilia.